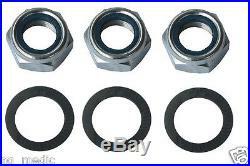 Replacement Caroni blade mounting nut and washer kit. Original equipment replacement parts, the 18mm nylon locking low profile nut and the matching 18mm shnorr washer are exact replacements for your mower. Maschio Part numbers: 1219 / 1801. We are listing new items frequently so please check our store often. Your complete satisfaction is important to us, should you have and problems please let us know so we can correct them. If you have any question about the part you need, please call first we will be glad to answer your questions. All parts are guaranteed to meet with your approval! The item "Caroni Finish Mower Blade Nut and Washer codes 1219 / 1801" is in sale since Tuesday, July 24, 2018. This item is in the category "Business & Industrial\Heavy Equipment, Parts & Attachments\Heavy Equipment Attachments\Mower Decks". The seller is "ag_medic" and is located in Amelia, Ohio.